Other Names*: Elizabeth Kenner, Elizabeth Jane Kenner Rouse, Elizabeth Rouse, Elizabeth Jane Rouse, Jane Rouse. [S5] Kellie Loop, Rice, Tex., miscellaneous papers, pp. 7 (giving her name as Jane Elizabeth and indicating that William Buckner Kenner was her father), p. 8 (giving her name as Elizabeth Jane and indicating that William Buckner Kenner was her father). 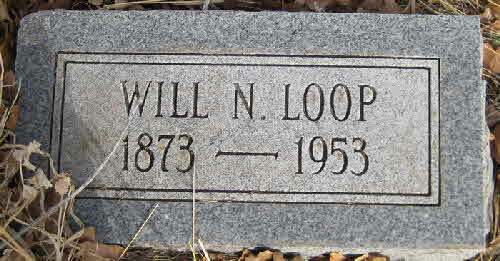 Miss Loop collected family data for decades, probably from the 1930s to the 1970s. Some of it is in her handwriting, and much of it appears to have been written by others and sent to her, but very little of it contains source attribution. There are inconsistencies within the papers. In 1974 the papers were in the possession of Roger Bartlett, Austin, Tex., who assigned the page numbers for ease of reference. [S8] Corsicana Daily Sun, Corsicana, Tex., 9 Jun 1943, pp. 1, 7 (obituary of William B. Kenner) (naming William B. Kenner as her father). [S5] Kellie Loop, miscellaneous papers, above p. 7 (giving her name as Jane Elizabeth and indicating that Janie Babb was her mother), p. 8 (giving her name as Elizabeth Jane and indicating that Janie Babb was her mother). [S5] Kellie Loop, miscellaneous papers, above pp. 8, 18 (date only). [S58] Index to Texas Birth Records (Austin, Tex. : Tex. Dept. of Health, Bur. of Vital Statistics), typescript 1922, vol. 2, p. 769, file 47245. [S312] Social Security Death Index, online at http://tinyurl.com/AncestrySSDI, viewed on 9 Mar 1998 (giving only the date). [S5] Kellie Loop, miscellaneous papers, above pp. 8, 18. [S312] Social Security Death Index, online at http://tinyurl.com/AncestrySSDI, viewed on 9 Mar 1998 (not naming the place of death but stating that she lived in Fort Worth, Texas when she died). [S1108] Social Security Death Index, online at http://tinyurl.com/RootswebSSDI, viewed on 20 Feb 2010. [S5] Kellie Loop, Rice, Tex., miscellaneous papers, pp. 8, 18. Miss Loop collected family data for decades, probably from the 1930s to the 1970s. Some of it is in her handwriting, and much of it appears to have been written by others and sent to her, but very little of it contains source attribution. There are inconsistencies within the papers. In 1974 the papers were in the possession of Roger Bartlett, Austin, Tex., who assigned the page numbers for ease of reference. [S1108] Social Security Death Index, online at http://tinyurl.com/RootswebSSDI, viewed on 20 Feb 2010 (not naming the place of death but stating that he lived in Ft. Worth, Tex. when he died). [S1559] Texas Death Index, 1964-1998, online at https://www.familysearch.org, record for Rochelle Reeves Rouse, viewed on 25 Jan 2019. [S58] Index to Texas Birth Records (Austin, Tex. : Tex. Dept. of Health, Bur. of Vital Statistics), typescript 1969, vol. 4, p. 1691, file 136025. [S11] Index to Texas Death Records (Austin, Tex. : Tex. Dept. of Health, Bur. of Vital Statistics), typescript, 1974, vol. 2, p. 741, file 53821 (giving the county but not the city). [S1559] Texas Death Index, 1964-1998, online at https://www.familysearch.org, record for Bryan Kelly Hicks, viewed on 28 Jan 2019. William Babb Kenner's tombstone, Oakwood Cemetery, Corsicana, Tex. Other Names*: William Kenner, Billy Babb Kenner, Billy Kenner. [S5] Kellie Loop, Rice, Tex., miscellaneous papers, pp. 7, 8 (indicating that William Buckner Kenner was his father). Miss Loop collected family data for decades, probably from the 1930s to the 1970s. Some of it is in her handwriting, and much of it appears to have been written by others and sent to her, but very little of it contains source attribution. There are inconsistencies within the papers. In 1974 the papers were in the possession of Roger Bartlett, Austin, Tex., who assigned the page numbers for ease of reference. [S8] Corsicana Daily Sun, Corsicana, Tex., 9 Jun 1943, pp. 1, 7 (obituary of William B. Kenner) (naming William B. Kenner as his father). [S5] Kellie Loop, miscellaneous papers, above pp. 7, 8 (indicating that Janie Babb was his mother). [S5] Kellie Loop, miscellaneous papers, above pp. 8, 18 (giving the date but not the place). [S58] Index to Texas Birth Records (Austin, Tex. : Tex. Dept. of Health, Bur. of Vital Statistics), typescript 1925, vol. 2, p. 886, file 88019 (not giving his name but identifying him as "Infant of W. B. Kenner"). [S1017] Navarro County, Texas Genealogical and Historical Web Site, online at http://www.rootsweb.ancestry.com/~txnavarr/index.htm (including photograph of grave marker giving date but not the place). 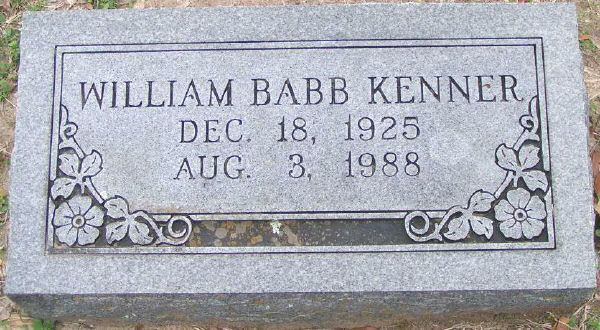 [S961] Find A Grave, online at http://www.findagrave.com, memorial for William Babb Kenner, memorial no. 100725115, viewed on 8 Feb 2013 (giving the date but not the place). [S1017] Navarro County, Texas Genealogical and Historical Web Site, online, above (showing photograph of grave marker giving date but not the place). [S1559] Texas Death Index, 1964-1998, online at https://www.familysearch.org, record for William Babb Kenner, viewed on 25 Jan 2019. [S1017] Navarro County, Texas Genealogical and Historical Web Site, online, above (including photograph of grave marker). Obituary*: Mrs. Ann Kenner Blount, age 83, passed away peacefully with her family by her side on Monday, Jan. 14, 2013 at the Belmont at Twin Creeks Nursing Home in Allen. She was born March 7, 1929 in Corsicana to William B. and Janie Kenner. 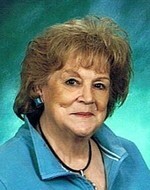 Ann graduated from Corsicana High School in 1946. She spent over 30 years in Pasadena, Texas where she raised her family and took pride in her work as an employment counselor. She loved playing bridge and enjoyed bargain shopping, especially for jewelry. She was a very fun-loving individual and as a result had many, many friends. Ann always considered Corsicana her “home” where she spent the majority of her remaining years. Ann was preceded in death by her parents, her husband Wayne Blount, her siblings Jane Rouse and William Kenner, and her grandson Richard Davidson. . . .
[S5] Kellie Loop, Rice, Tex., miscellaneous papers, pp. 7, 8 (indicating that William Buckner Kenner was her father). Miss Loop collected family data for decades, probably from the 1930s to the 1970s. Some of it is in her handwriting, and much of it appears to have been written by others and sent to her, but very little of it contains source attribution. There are inconsistencies within the papers. In 1974 the papers were in the possession of Roger Bartlett, Austin, Tex., who assigned the page numbers for ease of reference. [S585] Corsicana Daily Sun, Corsicana, Tex., online at http://www.corsicanadailysun.com 16 Jan 2013 (obituary of Mrs. Ann Kenner Blount) (naming William B. Kenner as her father). [S1252] Corley Funeral Home, Corsicana, Tex., online at http://www.corleyfuneralhome.com, memorial for Carey Ann Blount (naming William B. Kenner as her father). [S5] Kellie Loop, miscellaneous papers, above pp. 7, 8 (indicating that Janie Babb was her mother). [S1252] Corley Funeral Home, online, above, memorial for Carey Ann Blount (naming Janie Kenner as her mother). [S585] Corsicana Daily Sun, Corsicana, Tex., online at http://www.corsicanadailysun.com 16 Jan 2013 (obituary of Mrs. Ann Kenner Blount) (naming Janie Kenner as her mother). [S58] Index to Texas Birth Records (Austin, Tex. : Tex. Dept. of Health, Bur. of Vital Statistics), typescript 1929, vol. 2, p. 988, file 25566 (giving the date and county). [S1252] Corley Funeral Home, online, above, memorial for Carey Ann Blount. [S585] Corsicana Daily Sun, Corsicana, Tex., online at http://www.corsicanadailysun.com 16 Jan 2013 (obituary of Mrs. Ann Kenner Blount). William Newton Loop's tombstone, Leuders Cemetery (also known as Clear Fork Cemetery), Leuders, Tex., by Carla Young. [S32] Ruby L. Howse, letter to Roger Bartlett, 3 Nov 1973. [S5] Kellie Loop, Rice, Tex., miscellaneous papers, p. 8 (indicating that John Nelson Loop was his father). Miss Loop collected family data for decades, probably from the 1930s to the 1970s. Some of it is in her handwriting, and much of it appears to have been written by others and sent to her, but very little of it contains source attribution. There are inconsistencies within the papers. In 1974 the papers were in the possession of Roger Bartlett, Austin, Tex., who assigned the page numbers for ease of reference. [S1074] 1880 U.S. Census, Navarro County, Tex., 129th enumeration dist., p. 27, dwelling 245, family 247 (naming John Loop as his father). [S1179] Certificate of death, no. 47173 for William Newton Loop, dated 21 Sep 1953, Henry Loop, informant, per copy viewed online at pilot.familysearch.org on 4 Jul 2008 (naming J. N. Loop as his father). [S5] Kellie Loop, miscellaneous papers, above p. 8 (indicating that Melvina Parks was his mother). [S1179] Certificate of death, no. 47173 for William Newton Loop, dated 21 Sep 1953, Henry Loop, informant, per copy viewed online at pilot.familysearch.org on 4 Jul 2008 (naming Melviny Parks as his mother). [S5] Kellie Loop, miscellaneous papers, above pp. 9, 14 (giving the date but not the place). [S682] Lueders Cemetery (Clear Fork Cemetery), online http://www.rootsweb.com/~txshacke/luederscem.htm, downloaded 18 Oct 2001, (giving the date but not the place). [S1074] 1880 U.S. Census, Navarro County, Tex., 129th enumeration dist., p. 27, dwelling 245, family 247 (indicating that he was born in Texas in 1853 or 1854). [S1179] Certificate of death, no. 47173 for William Newton Loop, dated 21 Sep 1953, Henry Loop, informant, per copy viewed online at pilot.familysearch.org on 4 Jul 2008. [S961] Find A Grave, online at http://www.findagrave.com, memorial for William Newton Loop, memorial no. 55207548, viewed on 4 Jul 2011 (giving the date but no other information). [S15] Navarro County, Texas Marriages, vol. 2, 1889-1899 (Corsicana, Tex. : The Navarro County Gen. Soc'y, 1987), p. 164 (citing Navarro County, Texas Marriage Records, vol. IX, p. 89) (spelling her name as Loula). [S796] Navarro County Cemetery Records, vol. 7 (Corsicana, Tex. : The Navarro County Gen. Soc'y, 1987), New Chatfield Cemetery survey, p. 2 (identifying her as "wife of W. M. Loop" but not giving the date or place). [S1024] World War I draft registration online, no. 2715, Will Newton Loop, viewed on www.ancestry.com on 20 Mar 2005 (not giving the date or place but naming Mrs. Lula Loop as his nearest relative). [S961] Find A Grave, online, above, memorial for Lula Amanda Tarrer Loop, memorial no. 131261461, viewed on 12 Mar 2016. [S11] Index to Texas Death Records (Austin, Tex. : Tex. Dept. of Health, Bur. of Vital Statistics), typescript, 1953, vol. 2, p. 714, file 47173 (giving the date and county). [S682] Lueders Cemetery (Clear Fork Cemetery), online, above, (not giving the date). [S961] Find A Grave, online, above, memorial for William Newton Loop, memorial no. 55207548, viewed on 4 Jul 2011 (identifying the cemetery as Leuders Cemetery and not giving the date). [S32] Ruby L. Howse, letter to Roger Bartlett, 3 Nov 1973 (stating that he was known as Will and lived in Leuders, Texas). [S1024] World War I draft registration online, no. 2715, Will Newton Loop, viewed on www.ancestry.com on 20 Mar 2005. [S1179] Certificate of death, no. 47173 for William Newton Loop, dated 21 Sep 1953, Henry Loop, informant, per copy viewed online at pilot.familysearch.org on 4 Jul 2008 (stating that he was a retired farmer). [S5] Kellie Loop, miscellaneous papers, above p. 9 (identifying Will Newton Loop as his father). [S1179] Certificate of death, no. 64997 for Robert Harold Loop, dated 13 Oct 1963, Henrietta Lieb, informant, per copy viewed online at pilot.familysearch.org on 4 Jul 2008 (naming Will Loop as his father). [S5] Kellie Loop, miscellaneous papers, above p. 9 (identifying Will Newton Loop as her father). [S961] Find A Grave, online, above, memorial for Henrietta Elizabeth Loop Lieb, memorial no. 55430846, viewed on 2 Aug 2013 (naming William N. Loop as her father). Other Names*: Lula Amanda Tarver, Lula Tarver, Lula Tarrer, Lula Amanda Loop, Lura Loop, Lula Loop. [S1178] Standard certificate of death (Texas Department of Health, Bureau of Vital Statistics), no. 12700 for Lura Loop, filed 6 Apr 1932, Henry Loop, informant, per copy viewed online at pilot.familysearch.org on 4 Jul 2008 (naming Harry Tarrer as her father). [S961] Find A Grave, online at http://www.findagrave.com, memorial for Lula Amanda Tarrer Loop, memorial no. 131261461, viewed on 12 Mar 2016 (naming Harry Tarrer as her father). [S5] Kellie Loop, Rice, Tex., miscellaneous papers, p. 9 (giving the date but not the place). Miss Loop collected family data for decades, probably from the 1930s to the 1970s. Some of it is in her handwriting, and much of it appears to have been written by others and sent to her, but very little of it contains source attribution. There are inconsistencies within the papers. In 1974 the papers were in the possession of Roger Bartlett, Austin, Tex., who assigned the page numbers for ease of reference. [S1178] Standard certificate of death (Texas Department of Health, Bureau of Vital Statistics), no. 12700 for Lura Loop, filed 6 Apr 1932, Henry Loop, informant, per copy viewed online at pilot.familysearch.org on 4 Jul 2008. [S11] Index to Texas Death Records (Austin, Tex. : Tex. Dept. of Health, Bur. of Vital Statistics), typescript, 1903-40, vol. 31, p. 15101, file 12700 (giving her name as Lura Loop) (giving the date and county but not the city). [S796] Navarro County Cemetery Records, vol. 7, above, New Chatfield Cemetery survey, p. 2. [S1178] Standard certificate of death (Texas Department of Health, Bureau of Vital Statistics), no. 12700 for Lura Loop, filed 6 Apr 1932, Henry Loop, informant, per copy viewed online at pilot.familysearch.org on 4 Jul 2008 (stating that she was buried in Chatfield Cemetery on 31 Mar 1932 without identifying which cemetery). [S5] Kellie Loop, miscellaneous papers, above p. 9 (naming Lula Farrer [sic] as his mother). [S1179] Certificate of death, no. 64997 for Robert Harold Loop, dated 13 Oct 1963, Henrietta Lieb, informant, per copy viewed online at pilot.familysearch.org on 4 Jul 2008 (naming Lula Tarrer as his mother). [S5] Kellie Loop, miscellaneous papers, above p. 9 (naming Lula Farrer [sic] as her mother). [S961] Find A Grave, online, above, memorial for Henrietta Elizabeth Loop Lieb, memorial no. 55430846, viewed on 2 Aug 2013 (naming Lula Amanda Tarver as her motther). William Henry Loop's tombstone, Leuders Cemetery (also known as Clear Fork Cemetery), Leuders, Tex., by Carla Young. [S5] Kellie Loop, Rice, Tex., miscellaneous papers, p. 9 (identifying Will Newton Loop as his father). Miss Loop collected family data for decades, probably from the 1930s to the 1970s. Some of it is in her handwriting, and much of it appears to have been written by others and sent to her, but very little of it contains source attribution. There are inconsistencies within the papers. In 1974 the papers were in the possession of Roger Bartlett, Austin, Tex., who assigned the page numbers for ease of reference. [S137] Index to Texas Delayed Probate Birth Records (Austin, Tex. : Tex. Dept. of Health, Bur. of Vital Statistics), vol. 22, p. 10609, file 313736. [S312] Social Security Death Index, online at http://tinyurl.com/AncestrySSDI, viewed on 20 Mar 1998 (giving the date but not the place). [S961] Find A Grave, online at http://www.findagrave.com, memorial for W. Henry Loop, memorial no. 55477459, viewed on 4 Jul 2011. [S5] Kellie Loop, miscellaneous papers, above pp. 9, 14. [S682] Lueders Cemetery (Clear Fork Cemetery), online, above. [S961] Find A Grave, online, above, memorial for W. Henry Loop, memorial no. 55477459, viewed on 4 Jul 2011 (identifying the cemetery as Leuders Cemetery). [S11] Index to Texas Death Records (Austin, Tex. : Tex. Dept. of Health, Bur. of Vital Statistics), typescript, 1964-1988 (microfiche), p. 25331, file 78814-64 (naming the county but not the city). [S312] Social Security Death Index, online at http://tinyurl.com/AncestrySSDI, viewed on 20 Mar 1998 (giving only the month and year and not naming the place). [S682] Lueders Cemetery (Clear Fork Cemetery), online, above, (giving only the date). [S1559] Texas Death Index, 1964-1998, online at https://www.familysearch.org, record for William Henry Loop, viewed on 28 Jan 2019. [S5] Kellie Loop, miscellaneous papers, above pp. 9, 14 (stating that they had no children). [S1024] World War I draft registration online, no. 3327, William Henry Loop, viewed on www.ancestry.com on 20 Mar 2005 (giving 17 Aug 1899 as his birth date). Mae Stifflemire Loop's tombstone, Leuders Cemetery (also known as Clear Fork Cemetery), Leuders, Tex., by Carla Young. [S312] Social Security Death Index, online at http://tinyurl.com/AncestrySSDI, viewed on 18 Oct 2001. [S682] Lueders Cemetery (Clear Fork Cemetery), online http://www.rootsweb.com/~txshacke/luederscem.htm, downloaded 18 Oct 2001, (giving only the year). [S961] Find A Grave, online at http://www.findagrave.com, memorial for Mae Loop, memorial no. 55477366, viewed on 4 Jul 2011 (giving the year but no other information). [S5] Kellie Loop, Rice, Tex., miscellaneous papers, pp. 9, 14. Miss Loop collected family data for decades, probably from the 1930s to the 1970s. Some of it is in her handwriting, and much of it appears to have been written by others and sent to her, but very little of it contains source attribution. There are inconsistencies within the papers. In 1974 the papers were in the possession of Roger Bartlett, Austin, Tex., who assigned the page numbers for ease of reference. [S312] Social Security Death Index, online at http://tinyurl.com/AncestrySSDI, viewed on 18 Oct 2001 (stating that she died in Sep 1990 and not naming the place). [S682] Lueders Cemetery (Clear Fork Cemetery), online, above, (giving only the year and not naming the place). [S682] Lueders Cemetery (Clear Fork Cemetery), online, above, (stating that she was the wife of W. Henry Loop). [S961] Find A Grave, online, above, memorial for Mae Loop, memorial no. 55477366, viewed on 4 Jul 2011 (identifying the cemetery as Leuders Cemetery). [S5] Kellie Loop, miscellaneous papers, above p. 14 (giving the date but not the place). [S137] Index to Texas Delayed Probate Birth Records (Austin, Tex. : Tex. Dept. of Health, Bur. of Vital Statistics), vol. 22, p. 10609, file 531697 (giving the date and county). [S1179] Certificate of death, no. 64997 for Robert Harold Loop, dated 13 Oct 1963, Henrietta Lieb, informant, per copy viewed online at pilot.familysearch.org on 4 Jul 2008 (stating that he was born on 5 Dec 1900 in Texas). [S1179] Certificate of death, no. 64997 for Robert Harold Loop, dated 13 Oct 1963, Henrietta Lieb, informant, per copy viewed online at pilot.familysearch.org on 4 Jul 2008. [S5] Kellie Loop, miscellaneous papers, above p. 9 (stating that they had no children). [S5] Kellie Loop, Rice, Tex., miscellaneous papers, p. 9 (identifying Will Newton Loop as her father). Miss Loop collected family data for decades, probably from the 1930s to the 1970s. Some of it is in her handwriting, and much of it appears to have been written by others and sent to her, but very little of it contains source attribution. There are inconsistencies within the papers. In 1974 the papers were in the possession of Roger Bartlett, Austin, Tex., who assigned the page numbers for ease of reference. [S961] Find A Grave, online at http://www.findagrave.com, memorial for Henrietta Elizabeth Loop Lieb, memorial no. 55430846, viewed on 2 Aug 2013 (naming William N. Loop as her father). [S5] Kellie Loop, miscellaneous papers, above p. 9 (giving the date but not the place). [S137] Index to Texas Delayed Probate Birth Records (Austin, Tex. : Tex. Dept. of Health, Bur. of Vital Statistics), vol. 22, p. 10609, file 313754 (giving the date and county). [S312] Social Security Death Index, online at http://tinyurl.com/AncestrySSDI, viewed on 18 Mar 1998 (giving the date but not the place). [S961] Find A Grave, online, above, memorial for Henrietta Elizabeth Loop Lieb, memorial no. 55430846, viewed on 2 Aug 2013 (giving the year and place). [S5] Kellie Loop, miscellaneous papers, above pp. 9, 14 (not giving the date). [S961] Find A Grave, online, above, memorial for Henry Arthur Lieb, memorial no. 55428581, viewed on 2 Aug 2013. [S961] Find A Grave, online, above, memorial for Henrietta Elizabeth Loop Lieb, memorial no. 55430846, viewed on 2 Aug 2013. [S312] Social Security Death Index, online at http://tinyurl.com/AncestrySSDI, viewed on 18 Mar 1998 (giving the month and year but not the place). [S5] Kellie Loop, miscellaneous papers, above pp. 9, 14 (stating that they had two children). [S961] Find A Grave, online, above, memorial for Henrietta Elizabeth Loop Lieb, memorial no. 55430846, viewed on 2 Aug 2013 (stating that she was a Methodist and moved to Leuders in 1912). [S961] Find A Grave, online, above, memorial for August Frederick Graeffe 'Red' Lieb, memorial no. 104675263, viewed on 2 Aug 2013 (naming Henrietta Elizabeth Loop Lieb as his mother). [S961] Find A Grave, online at http://www.findagrave.com, memorial for Henry Arthur Lieb, memorial no. 55428581, viewed on 2 Aug 2013 (naming Henry Lieb as his father). [S961] Find A Grave, online, above, memorial for Henry Arthur Lieb, memorial no. 55428581, viewed on 2 Aug 2013 (naming Minna Graffe as his mother). [S5] Kellie Loop, Rice, Tex., miscellaneous papers, pp. 9, 14 (not giving the date). Miss Loop collected family data for decades, probably from the 1930s to the 1970s. Some of it is in her handwriting, and much of it appears to have been written by others and sent to her, but very little of it contains source attribution. There are inconsistencies within the papers. In 1974 the papers were in the possession of Roger Bartlett, Austin, Tex., who assigned the page numbers for ease of reference. [S961] Find A Grave, online, above, memorial for August Frederick Graeffe 'Red' Lieb, memorial no. 104675263, viewed on 2 Aug 2013 (stating that his father, Henry, was known as Chick). [S961] Find A Grave, online, above, memorial for August Frederick Graeffe 'Red' Lieb, memorial no. 104675263, viewed on 2 Aug 2013 (naming Henry Arthur Lieb as his father). [S1178] Standard certificate of death (Texas Department of Health, Bureau of Vital Statistics), no. 46305 for George H. Loop, filed 14 Oct 1938, George Loop, informant, per copy viewed online at pilot.familysearch.org on 4 Jul 2008 (naming W. N. Loop as his father). [S1074] 1880 U.S. Census, Navarro County, Tex., 129th enumeration dist., p. 27, dwelling 245, family 247 (indicating that he was born in Texas in 1855 or 1856). [S1178] Standard certificate of death (Texas Department of Health, Bureau of Vital Statistics), no. 46305 for George H. Loop, filed 14 Oct 1938, George Loop, informant, per copy viewed online at pilot.familysearch.org on 4 Jul 2008 (stating that he was born on 21 May 1876 in Texas). [S11] Index to Texas Death Records (Austin, Tex. : Tex. Dept. of Health, Bur. of Vital Statistics), typescript, 1903-1940, vol. 31, p. 15101, file 46305 (giving the date and county but not the city). [S1178] Standard certificate of death (Texas Department of Health, Bureau of Vital Statistics), no. 46305 for George H. Loop, filed 14 Oct 1938, George Loop, informant, per copy viewed online at pilot.familysearch.org on 4 Jul 2008 (stating that he died on 13 Oct 1938 on Espenlaub Road in McAllen, Texas). [S1178] Standard certificate of death (Texas Department of Health, Bureau of Vital Statistics), no. 46305 for George H. Loop, filed 14 Oct 1938, George Loop, informant, per copy viewed online at pilot.familysearch.org on 4 Jul 2008. [S5] Kellie Loop, miscellaneous papers, above p. 9 (spelling his middle name as Elmon and identifying George Hamilton Loop as his father). [S5] Kellie Loop, miscellaneous papers, above p. 9 (spelling his middle name as Elmon and identifying Amy Dial as his mother). [S5] Kellie Loop, Rice, Tex., miscellaneous papers, p. 14 (spelling his middle name as Elmon). Miss Loop collected family data for decades, probably from the 1930s to the 1970s. Some of it is in her handwriting, and much of it appears to have been written by others and sent to her, but very little of it contains source attribution. There are inconsistencies within the papers. In 1974 the papers were in the possession of Roger Bartlett, Austin, Tex., who assigned the page numbers for ease of reference. [S11] Index to Texas Death Records (Austin, Tex. : Tex. Dept. of Health, Bur. of Vital Statistics), typescript, 1964-88 (microfiche), p. 25331, file 13964-82 (includes birth date). [S11] Index to Texas Death Records, typescript, above, 1964-88 (microfiche), p. 25331, file 13964-82 (naming the county but not the city). [S312] Social Security Death Index, online at http://tinyurl.com/AncestrySSDI, viewed on 18 Mar 1998 (stating that he died in Mar 1982; not naming the place of death but stating that he lived in San Antonio, Texas when he died). [S1559] Texas Death Index, 1964-1998, online at https://www.familysearch.org, record for George Elmond Loop, viewed on 28 Jan 2019. Other Names*: Kate Loop, Kate Elizabeth Loop Scott, Kate Loop Scott, Kate Elizabeth Scott, Kate Scott, Katie Elizabeth Scott. [S5] Kellie Loop, Rice, Tex., miscellaneous papers, p. 8 (indicating that John Nelson Loop was her father). Miss Loop collected family data for decades, probably from the 1930s to the 1970s. Some of it is in her handwriting, and much of it appears to have been written by others and sent to her, but very little of it contains source attribution. There are inconsistencies within the papers. In 1974 the papers were in the possession of Roger Bartlett, Austin, Tex., who assigned the page numbers for ease of reference. [S1074] 1880 U.S. Census, Navarro County, Tex., 129th enumeration dist., p. 27, dwelling 245, family 247 (naming John Loop as her father). [S5] Kellie Loop, miscellaneous papers, above p. 8 (indicating that Melvina Parks was her mother). [S1074] 1880 U.S. Census, Navarro County, Tex., 129th enumeration dist., p. 27, dwelling 245, family 247 (stating that she was born in Texas in Dec 1879). [S961] Find A Grave, online at http://www.findagrave.com, memorial for Kate E. Scott, memorial no. 97433705, viewed on 11 Oct 2015 (stating that she was born in 1879 with no other information). [S5] Kellie Loop, miscellaneous papers, above pp. 9 (giving his name as Bob Scott), 14. [S1092] Abilene Reporter-News, Abilene, Tex., 31 Jul 1967, p. 8-A, col. 3 (obituary of Mrs. R. R. Scott) (giving her name as Katie Elizabeth Loop and his as R. R. Scott). [S961] Find A Grave, online, above, memorial for Kate E. Scott, memorial no. 97433705, viewed on 11 Oct 2015 (not giving the date). [S961] Find A Grave, online, above, memorial for Robert R. Scott, memorial no. 97433756, viewwed on 11 Oct 2015 (not giving the date). [S11] Index to Texas Death Records (Austin, Tex. : Tex. Dept. of Health, Bur. of Vital Statistics), typescript, 1967, vol. 3, p. 1267, file 46675 (giving her name as Katie Elizabeth Scott and naming only the county as her place of death). [S312] Social Security Death Index, online at http://tinyurl.com/AncestrySSDI, viewed on 18 Mar 1998 (stating that she died in Jul 1967; not naming the place of death but stating that she lived in Anson, Texas when she died). [S1092] Abilene Reporter-News, Abilene, Tex., 31 Jul 1967, p. 8-A, col. 3 (obituary of Mrs. R. R. Scott) (stating that she died at 8:15 a.m. following an illness of several weeks). [S1092] Abilene Reporter-News, Abilene, Tex., 31 Jul 1967, p. 8-A, col. 3 (obituary of Mrs. R. R. Scott). [S5] Kellie Loop, miscellaneous papers, above p. 9 (identifying Kate Elizabeth Loop as her mother). [S5] Kellie Loop, miscellaneous papers, above p. 9 (identifying Kate Elizabeth Loop as his mother). Other Names*: Robert Scott, R. R. Scott, Bob Scott. [S961] Find A Grave, online at http://www.findagrave.com, memorial for Robert R. Scott, memorial no. 97433756, viewwed on 11 Oct 2015 (giving the year but no other information). [S961] Find A Grave, online, above, memorial for Robert R. Scott, memorial no. 97433756, viewwed on 11 Oct 2015. [S5] Kellie Loop, miscellaneous papers, above p. 9 (identifying Bob Scott as her father). [S5] Kellie Loop, miscellaneous papers, above p. 9 (identifying Bob Scott as his father). [S5] Kellie Loop, Rice, Tex., miscellaneous papers, p. 9 (identifying Bob Scott as her father). Miss Loop collected family data for decades, probably from the 1930s to the 1970s. Some of it is in her handwriting, and much of it appears to have been written by others and sent to her, but very little of it contains source attribution. There are inconsistencies within the papers. In 1974 the papers were in the possession of Roger Bartlett, Austin, Tex., who assigned the page numbers for ease of reference. [S5] Kellie Loop, miscellaneous papers, above p. 9 (date only). [S137] Index to Texas Delayed Probate Birth Records (Austin, Tex. : Tex. Dept. of Health, Bur. of Vital Statistics), vol. 32, p. 15743, file 329255. [S312] Social Security Death Index, online at http://tinyurl.com/AncestrySSDI, viewed on 2 Apr 1998 (not naming the place of death but stating that she lived in Abilene, Texas when she died). [S1559] Texas Death Index, 1964-1998, online at https://www.familysearch.org, record for Irene Scott, viewed on 25 Jan 2019. [S5] Kellie Loop, miscellaneous papers, above pp. 9, 14 (never married). [S5] Kellie Loop, Rice, Tex., miscellaneous papers, p. 9 (identifying Bob Scott as his father). Miss Loop collected family data for decades, probably from the 1930s to the 1970s. Some of it is in her handwriting, and much of it appears to have been written by others and sent to her, but very little of it contains source attribution. There are inconsistencies within the papers. In 1974 the papers were in the possession of Roger Bartlett, Austin, Tex., who assigned the page numbers for ease of reference. [S137] Index to Texas Delayed Probate Birth Records (Austin, Tex. : Tex. Dept. of Health, Bur. of Vital Statistics), vol. 32, p. 15751, file 855351. [S312] Social Security Death Index, online at http://tinyurl.com/AncestrySSDI, viewed on 2 Apr 1998 (spelling his first name as Loyd; not naming the place of death but stating that he lived in Anson, Texas when he died). 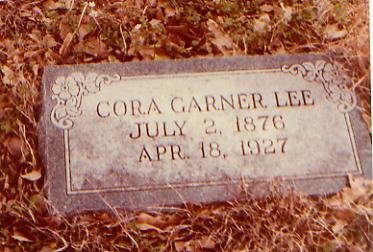 Cora Garner Lee's tombstone, New Cemetery, Chatfield, Tex., courtesy of Mary H. Shearer. [S961] Find A Grave, online at http://www.findagrave.com, memorial for Cora Ann Garner Lee, memorial no. 69328409, viewed on 24 Jul 2011 (naming William Ceberry Garner as her father). [S961] Find A Grave, online, above, memorial for Cora Ann Garner Lee, memorial no. 69328409, viewed on 24 Jul 2011 (naming Ellen Rebecca Loop Garner as her mother). [S796] Navarro County Cemetery Records, vol. 7 (Corsicana, Tex. : The Navarro County Gen. Soc'y, 1987), New Chatfield Cemetery survey, p. 4. [S961] Find A Grave, online, above, memorial for Cora Ann Garner Lee, memorial no. 69328409, viewed on 24 Jul 2011. [S5] Kellie Loop, Rice, Tex., miscellaneous papers, p. 15. Miss Loop collected family data for decades, probably from the 1930s to the 1970s. Some of it is in her handwriting, and much of it appears to have been written by others and sent to her, but very little of it contains source attribution. There are inconsistencies within the papers. In 1974 the papers were in the possession of Roger Bartlett, Austin, Tex., who assigned the page numbers for ease of reference. [S961] Find A Grave, online, above, memorial for Cora Ann Garner Lee, memorial no. 69328409, viewed on 24 Jul 2011 (not giving the date). [S5] Kellie Loop, miscellaneous papers, above p. 15 (giving the date but not the place). [S796] Navarro County Cemetery Records, vol. 7, above, New Chatfield Cemetery survey, p. 4 (giving the date but not the place). [S5] Kellie Loop, miscellaneous papers, above p. 15 (stating that she was born on 2 Aug 1876 and that they had no children). [S961] Find A Grave, online at http://www.findagrave.com, memorial for Cora Ann Garner Lee, memorial no. 69328409, viewed on 24 Jul 2011 (not giving the date). [S31] Navarro Leaves and Branches, vol. XIV, no. II (May 1991), p. 5 (citing Navarro County, Tex. Marriage Records, bk. XIII, p. 338) (giving her surname as Cayce). [S11] Index to Texas Death Records (Austin, Tex. : Tex. Dept. of Health, Bur. of Vital Statistics), typescript, 1941-45, vol. 4, p. 1851, file 51540. [S312] Social Security Death Index, online at http://tinyurl.com/AncestrySSDI, viewed on 9 Mar 1998. [S312] Social Security Death Index, online at http://tinyurl.com/AncestrySSDI, viewed on 9 Mar 1998 (not naming the place of death but stating that he lived in Jal, New Mexico when he died). Death*: She died on 18 November 1988 at age 82. [S11] Index to Texas Death Records (Austin, Tex. : Tex. Dept. of Health, Bur. of Vital Statistics), typescript, 1964-1988 (microfiche), p. 38162, file 54667-78 (birth and death). [S312] Social Security Death Index, online at http://tinyurl.com/AncestrySSDI, viewed on 9 Mar 1998 (giving only the month and year and not naming the place of death). [S5] Kellie Loop, Rice, Tex., miscellaneous papers, p. 15 (spelling her name as Verta). Miss Loop collected family data for decades, probably from the 1930s to the 1970s. Some of it is in her handwriting, and much of it appears to have been written by others and sent to her, but very little of it contains source attribution. There are inconsistencies within the papers. In 1974 the papers were in the possession of Roger Bartlett, Austin, Tex., who assigned the page numbers for ease of reference. [S312] Social Security Death Index, online at http://tinyurl.com/AncestrySSDI, viewed on 9 Mar 1998 (not naming the place of death but stating that she lived in Bryan, Texas when she died). [S5] Kellie Loop, miscellaneous papers, above p. 15.